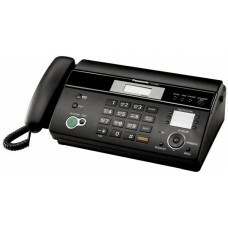 Panasonic KX-FT987 Fax Machine features phone and fax functionality in a simple and compact design. It features an Automatic Paper Cutter that Automatically cuts and stacks documents that are received or copied. The device boasts of a Fully Digital Answering System that answers calls, records messages as well as receives faxes while you are away. The Digital Duplex Speakerphone ensures low echo and reduced drop-out and clipping. All your phone conversations will be clear and natural. Panasonic KX-FT987 Fax Machine also has caller ID compatibility, so that you may view the name or number of the incoming callers on the LCD screen. You can even edit and store the caller ID memory, and print the list of your call records. The navigator key enables you to control system features, operating modes and as caller ID memory. The Out-of Paper Reception feature takes care of your work in case the device does not have any paper. Its stores up to 28 pages in its built-in memory, in case the device runs out of paper. It offers Sequential broadcasting for up to 20 locations. If you wish to send the same fax to multiple locations, you can easily program the device to do so automatically.